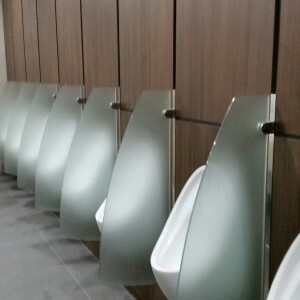 Ecoprod recently supplied 13 bespoke glass urinal privacy screens for the new Westfield shopping centre in Bradford – The Broadway. We can supply frosted or smoked, toughened safety glass urinal privacy dividers in standard or bespoke shapes to meet your requirements. Corporate branding is also an option. Please speak to us about your requirement for these products.